My love for Halloween started with suburban trick-or-treating. It wasn’t just the candy or costumes. For one night, the town transformed into a weirder, spookier place. We would walk further up the street than we’d ever normally venture – and in darkness, when strangers lit their houses in eerie colors and papered their walls with skeletons. Our clean-cut neighborhood turned shadowy and scary for a single evening. The next morning, Christmas decorations may as well have gone up. Halloween Night II bottles the giddiness of that fleeting Halloween makeover. The game is a sweet tribute to a night when, maybe, there could be ghosts outside your window. 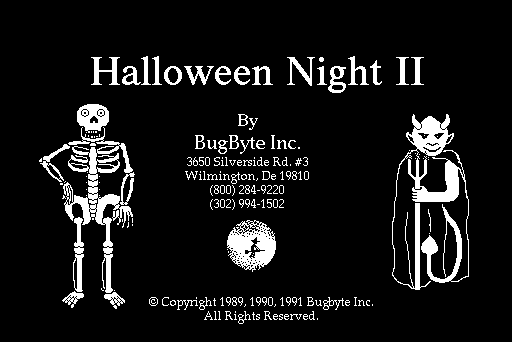 The game opens outside your house as you turn on the lights, ready for trick-or-treaters. A little witch flies in front of the moon, a sign of the supernatural evening to come. You aren’t leaving the house tonight, though: you’re staying inside to answer the door and hand out candy. After a pause, someone will knock on the door. You open it to see some sort of monster or witch. They’re creepy and certainly not human, but like the best cheesy Halloween scares, they don’t mean harm. They’re happy it’s Halloween too, and they just want some treats. Answering the door for a well-meaning Halloween creature is delightful every time. Your job is endearingly simple. The game has nothing to work against. You get to cheer them up on their favorite holiday… and wonder whether these are real monsters looking through the window. On Halloween, everyone buys into that possibility, even knowing it isn’t true. Eventually, the night wears on, and you can choose whenever you want to pack it in. You see one last glimpse of the outside of your house as you turn the lights off. Halloween has passed. But then a witch flies past the moon again. Were there really monsters? They’re gone now, at least, and it’s time to sleep. For a static shot of a house, these final few seconds pack a genuine tenderness. It reminded me of coming home after a night of trick-or-treating. Most kids had left the streets, and the sun had long since set. We left our lights and decorations up through the night, but as soon as we closed the front door behind us, the holiday was over. The scares were all play, and we had finished playing. Back cozy inside, everything returned to normal, removed from that exciting day when ghouls might have taken over our neighborhood. That’s what Halloween Night II gets right. The spooky world we make up once a year will be gone the next day. We can peek out into it for a night, then head home happy, scared, and safe. This reminds me of an old Mac OS Hypercard “game” called The Haunted House, by Mark Klink. Not much to it, but it still brings a little smile to my face, especially the version of the Hall of the Mountain King you can play on the radio.